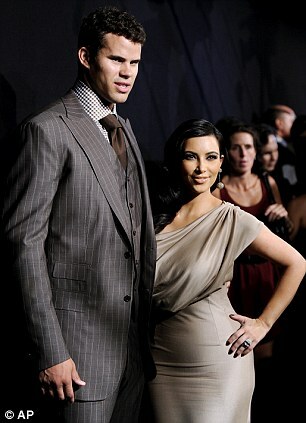 In his 72-days of marriage to Kim Kardashian, Kris Humphries may have learnt a thing or two about publicity stunts. And yesterday the NBA star apparently put his skills to use - as he hit the beach with a new bikini-clad woman - just as his lawyers are trying to keep his rumoured relationship with Fatima 'Myla' Sinanaj on the quiet. Perhaps in an attempt to pour cold water on their alleged romance, Kris was snapped in the company of a toned brunette, as they took an innocent splash together in the turquoise blue Miami sea. 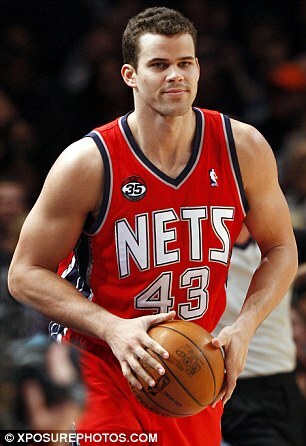 It comes as Humphries' lawyers want the basketball star to walk into his divorce depositions at the end of June looking like a heartbroken and very single man. Of course, these most recent pictures could present the case that Kris is merely on friendly terms with the ladies he is being spotted with, including Myla, whose company he was sharing last weekend on the beach. Kris' lawyers are going to great lengths to keep his new rumoured girlfriend Myla quiet about her supposed relationship with the 27-year-old basketball player, as they aim to prove that his 72-day marriage to reality TV star Kim was indeed fraud. According to TMZ, Humphries' lawyer reached out to Sinanaj's lawyer to negotiate a non-disclosure agreement in order to get a lockdown on any sensitive texts, emails, or other documents the 25-year-old Kardashian-lookalike has relating to their relationship. The Brooklyn Nets player is demanding millions from the 31-year-old socialite, and Kris doesn't want anything to jeopardize his case that their union should be annulled rather than granted a divorce. His lawyers are willing to pay a price in order to get Myla's signature on a joint statement as well. RadarOnline first reported that the six-foot-nine-inch athlete had no plans to publicly date anyone until after his divorce was finalized, but TMZ claimed that Kris has been dating Myla since January, even flying her to Miami for a romantic beach holiday last weekend. They have apparently been seeing each other regularly, meeting at various basketball games where Kris provided her and family members with courtside seats. The pair met at a prominent five star hotel in the Big Apple, TMZ claims. 'Kris is expecting to be asked if he has a girlfriend, or has had one since Kim filed for divorce,' an insider toldÂ RadarOnline. 'Kris will answer under oath that he hasn't had a girlfriend and that he is very single. Kris doesn't care that Kim is dating Kanye West, he has truly moved on with his life. Myla's Twitter page, which has since been deleted, had a number of interesting posts related to Kardashian patriarch Bruce Jenner and Kim's new boyfriend rapper Kanye West. 'Say my name, say my name. When no one is around, you say baby I love you. Why the sudden change?' Sinanaj tweeted, quoting a Destiny's Child song. '[Kanye should be] bigger than taking petty shots at s**t that got nothing to do with him. Lost respect,' read another post by Myla, commenting on his new song Theraflu. Kim began dating Kanye in April, and the pair are reportedly discussing moving in together, so Kris most likely wants to look single by comparison to his famous ex. 'Myla is very upset with Kris for not wanting an exclusive relationship,' a source told RadarOnline.